IBM Cloudant is a fully managed JSON document DBaaS that’s optimized for data availability, durability, and mobility - perfect for fast-growing mobile & web apps. What makes Cloudant unique is its advanced indexing and ability to push data to the network edge, across multiple data centers and devices, for faster access and greater fault tolerance. It allows users to access data anytime, anywhere. Click Demo below to visit Cloudant Learning Center and see a collection of demo videos. Operates at any scale – nonstop – by distributing database read and write access out to the network edge. Replicates and synchronizes readable and writable copies of data across multiple data centers or devices. Pushes database access so that you can scale bigger and enable client apps to continue running offline. Uses data access control, encryption and data backup features. Provides flexibility to choose among IBM Cloud, Rackspace, Amazon Web Services (AWS) or Windows Azure – and even change platforms on demand. 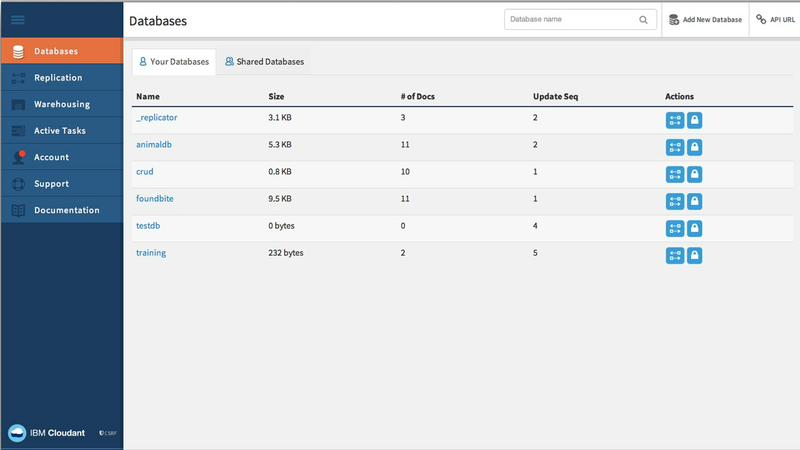 Get full functionality of Cloudant for development and evaluation, using a set amount of throughput and a 1GB max of encrypted data storage. The Standard plan offers full functionality through multiple tiers of provisioned throughput capacities as well as 20GB of encrypted data storage. An isolated dedicated environment that uses IBM Cloud data centers to run any number of Standard plan instances. HIPAA readiness available upon request.